This is a personal story about my time with my younger brother Joseph and how he had a meltdown in the waiting room of a doctors office. It’s kind of a long read. If you don’t know what a meltdown is, Google it. I’m letting you know that a meltdown is not the same as a tantrum. It’s due to frustration with communication, or anything for that matter, but this case is due to communication. 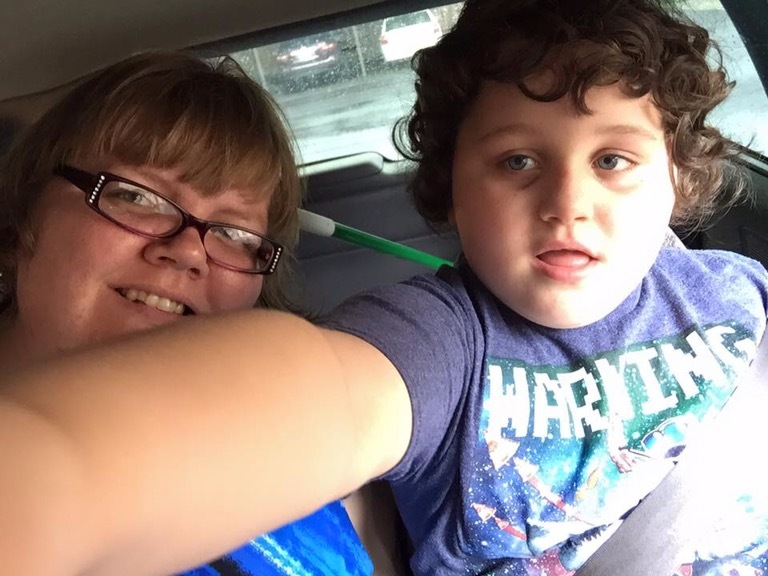 He has non verbal autism and is eight years old. It is a complicated situation. Today, since I wasn’t on campus at school, I had to do some errands with my mom. After our errands I went with my mom to one of Joseph’s appointments. This is why my day was different for me. Since I moved out of my moms place, and after I started college (both happened at two different times) I haven’t spent much time during the week with my mom or brother. I usually don’t see my mom except on Sunday’s, which is family day. Anyway, went to an appointment with my mom for Joseph. It was a behavioral appointment because of his autism. I don’t know the details, but that’s where what I’m about to talk about takes place. At some point Joseph tried to leave the room during his appointment. He wasn’t needed since it was my mom and the guy (the behaviorlist) talking. So I took him out to the waiting room. Everything was fine. Until he saw a disposable water bottle that is halfway filled with water. He started in on a meltdown. See, he uses empty water bottles for stemming. He already had a water bottle from earlier, but he loves to get a new water bottle every few hours or so to stem with. We either drink the water or pour it into a gallon sized water bottle. Google stemming. Essentially it’s meant to keep him calm. He uses it to hit his chin repeatedly. Every specialist that works with him knows this. He isn’t hurting himself, so they say it’s okay for him to do this since he is calming himself down. So the bottle was on the floor, he took my hand and pulled on it to go reach for it. I pulled my hand away and said no, he doesn’t need it. He started getting upset, so he pulled my hand again, I told him no again, that’s when he starts screaming. Well not a normal scream. It’s hard to explain, it’s like wailing, or an obvious sound that he’s upset, and it’s loud, and gets louder. 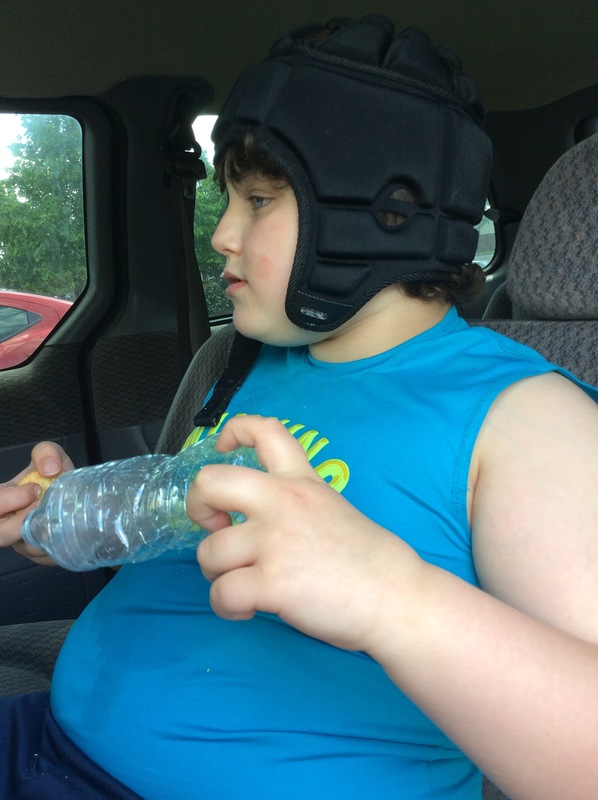 He wears a helmet to protect his head since when he goes into a meltdown he hits himself in the head.mmy mom was told by his occupational therapist that he chosen not to hurt anyone when he has a meltdown. He has chosen to only hurt himself. We are lucky, I am aware. That doesn’t mean someone won’t get hurt on accident if we get in his way of his legs kicking, or him wiggling around, or him running. So after he starts to hit himself in the head and gets louder and is squealing because he’s mad I pick up the water bottle to throw it away, which the garbage can is next to the front desk. He comes over and picks it up to hand to me. I tell him no and “I’m sorry, but this isn’t ours,” he don’t care. He wants the bottle. The lady at the desk looked concerned. I took the water bottle from his hand and put it on the counter and explained that he has autism and he stems with water bottles and someone left a water bottle half filled behind. She took it, apologized, and threw it away. She was great with handling the situation. Rather than get mad and give us dirty looks she tried to explain that it was hers to him (even though it wasn’t) and that she threw it away. He wasn’t happy. He pulled my hand a couple of times towards the desk to tell me he wanted it. I didn’t cave. I told him no and I’m sorry. I rubbed his back a little bit. I don’t know if it’s helpful, but it’s helpful for me. A way to calm me down since I’m overwhelmed myself. I’m trying something, which is better than nothing. I tried to calm him down, but I really don’t know how to. He was still really upset and on and off screaming and squealing. Oh man. To be honest, I was a little embarrassed. I’m not out in public often when he has meltdowns. I did apologize to her and she said I have to reason to apologize. I remembered my mom keeps water bottles out in the van for him, so I told him That and tried to get him out to the van. We can go and get one and just wait in the van for my mom while she was wrapping up with the guy. I was calm and trying to rub his back. He was leaning over the front desk at this point so upset and still mad. I stayed calm and quiet. I tried to direct him towards the door. He didn’t budge. After a little bit of rubbing his back and calmly telling him to go to the van for a water bottle. He finally started to move. I directed him to the van.hen he’s upset or in meltdown mode it’s hard to get him to move so I have to push him to go. It’s not a shove, but a push hard enough to get him to walk. He was resistant, but started to move enough to walk out of the door. First we stopped at the water fountains, there were two, so he can fill up his water bottle and pour it out, for both, the same way he came in. We made it to the van, finally. I opened his door, he got in and sat down, I grabbed a water bottle from the back. I sat next to him on the floor of the van, with my feet on the ground, he grabbed his Ritz crackers, and I started to drink the water from the bottle so I can give it to him. He was calm after that. When I was done with the water bottle I gave it to him, and he was happy. The meltdown was over. He is on Reaperadol, or however it’s spelt, for his behavior. He has only been on it for a month, but there has been an improvement on his meltdowns. They are shorter and less intense according to my mom. I took a picture post meltdown for some reason. He doesn’t care. There he is, crackers, water bottle, helmet, and all. He hates the strap being on, so It’s just kept not fastened. Just a random thought, sometimes when he’s getting upset, and he’s not wearing his helmet, he will put it on himself. It seems to calm him to wear it, but helpful so he won’t hurt himself. I love my brother, very much. I know earlier I said I was embarrassed, I was, and I’m not too afraid to admit it. I was embarrassed for many reasons. He was being loud, people were staring, and I didn’t know how to handle him. I don’t care if people stare. It only upsets me because they don’t understand. They don’t understand the scenario and why he is screaming. It isn’t just the fact that they are staring, it’s the fact that we get glared at a lot of the time. We are being judged most of the time, because they don’t understand the situation. Not everybody stares, glares, or judges, but a lot of people do. I am so thankful for the woman behind the front desk. She was calm and non judgmental. I appreciate her trying to help with the situation. I appreciate her little reminder that I don’t need to apologize for his behavior. I really don’t. That will probably be kind of controversial, apologizing for the behavior of a child, especially one with special needs. But I don’t have to. In that moment I was just more concerned about his well being and he was disturbing the peace as I call it. I can only imagine what my mom has to go through when she takes him into town, or to appointments, and he has a meltdown. My heart goes out to her. She is a tough woman to have to handle his meltdowns sometimes on a daily basis. My brother was adopted from a friend of mine in high school. My mom is in her 50’s and doing a pretty good job of handling Joseph. Sometimes he is a two man job, but my mom, at times, is the only one there to handle him. My dad works and my older sister isn’t always around when these things happen. (She lives at home). What I mean by a two man job is that to make things easier for my mom she needs another person to help to make it easier for her to take care of him. She doesn’t always get the extra help so she handles him on her own. I don’t know how she does it. It isn’t easy for her because of him being special needs. He is great and everybody in the family loves him. Thank you mom for being strong enough to take care of Joseph, especially on your own when nobody is around to help. Thank you for taking time to read my post. I know it’s long, but I appreciate you sticking through to the end. I know I have said some things that people won’t agree with, but I don’t care. Taking care of a special needs child isn’t easy. I strongly felt the need to post this. I know this is very personal, but I wanted to share this experience. I know that I have it easier than some people. I know things could be worse and he could have chosen to hurt us instead of himself. I am very thankful for that. My heart goes out to the parents of special needs children, but also those who have really bad behavioral problems. It must be hard. Anyway, thanks again for reading my post. I figured with the last blog post I made I should introduce my younger brother. His name is Joseph. He is eight years old. My mom adopted him from a friend of mine that I went to high school with. She brought him home from the hospital two days after he was born. He was about 18 months when the doctor saw a concern with his development. After about a year of tests he was diagnosed with Autism. About the summer of last year he was also diagnosed with Juvenile Diabetes. I love him so much. He is great. He is also very smart. He is non verbal, but didn’t use to be. At school he communicates with an iPad. At home we use a tiny bit of sign language, pictures, and when he pulls out food he wants, or gets dressed to go somewhere. He als hands us he did or tv remote to tell us he wants to watch something. He loves bubbles. When he was younger he would want us to blow bubbles for him all the time. Now, with some help, he blows bubbles all the time. He also loves trains. If he could he’d watch YouTube videos of trains all day. His favorite color is green. We know because he had two identical blankets, one green, one blue. He preferred the green one over the blue one. He loves pillows and stuffed animals. He has a huge pile of both in his room. He used to bring them all into the living room while watching tv, then back into the bedroom to sleep. I love this picture of us. I brought my phone upto take a picture with him. After a couple of photos he reached over and touched the round button on the screen to take a picture. He has never taken a picture himself of us together. Once in a while he will take a picture of I’m trying to get a picture, but most of the time just ignores me or pushes me away. Thanks for reading a little bit about my brother. Since I have decided to take time to introduce him I figured I should talk about him more in the future.